The following awesome column is written by Torie Fisher, founder of Backward Flag Brewing. This is part of “Dream Builders,” a series that spotlights how women turn their business aspirations into reality — often defying tremendous odds — and innovate along the way. Thanks to Chase News & Stories for letting us re-publish it. After serving 13 years in the U.S. Army and National Guard, I started to think about what life would be like after the military. I was passionate about making quality beer, so I started Backward Flag Brewing Co., a veteran owned and operated craft brewery. It wasn’t easy getting it started, and it’s not going to get easier any time soon. Like many breweries, it all started with homebrewing. I learned from one of the pilots I served with in the Army. A few bad batches led me to being completely obsessed in learning more. I started reading everything and constantly listened to podcasts — as soon as I woke up and stepped into the shower, I’d hit play. My biggest hurdle wasn’t learning how to make great beer — it was starting and operating my brewery. I had no business background. No one in my family ever owned a business. I didn’t even understand a few simple business terms. Here’s an embarrassing example: I remember calling someone to look at properties, and the person on the phone asked me how much capital I was working with. I didn’t know what the word “capital” meant. That’s how far behind I was in the business world. I had to catch up. I became a member of the Brewers Association, met with other brewery owners and got involved with my local SCORE office — a partner of the U.S. Small Business Association. Every few weeks, I would meet with one of the SCORE mentors to go through my business plan. I got questions I never would have thought about. This process led me to scrap the initial restaurant portion of my business plan and only focus on the brewery. And I’m not out of the ordinary — according to the latest Business Leaders Outlook report, 65 percent of veteran-owned businesses have mentors. I would encourage other veteran entrepreneurs to seek them out. Balance is hard. I’m very much involved in the business as well as trying to improve as a manager. We are currently going through an expansion, which finishes this December. Plus, I have a five-year-old daughter. During the week, I get up at 5 a.m. and work until I have to wake her up. My partner and I do a lot of juggling for school drop offs, pickups and everything in between. My ex-husband has her on the weekends, which is mainly when the brewery’s tasting room is open. It’s a lot of coordination. I also care about making time for my staff. I went through leadership classes during my time in the military, and one lesson I applied in my business: Make sure you’re taking care of your troops. If someone is having a bad day, take time to understand their personal life before jumping on them. I’m big on giving people room to grow. I’m there to oversee, but I believe everyone is a leader and can manage themselves. Since many of us are veterans or law enforcement, we operate in the same way. From the way we talk to each other, to having everything in the brewery in military time on a 24-hour clock. We work in organized chaos, and we have thick skin. There are things we care a lot about and have a lot of respect for, and there’s things that have taught us to not take life so seriously. The brewery industry is male dominated, but the assumptions multiply when you add veterans. I’ve encountered issues as a women business owner, but I’ve struggled more as a women veteran. I’ve heard: “Well, I thought this was a veteran-owned brewery?” Fortunately, most times my staff and I can have a laugh about the surprised looks we get when it’s unveiled that I’m the veteran owner. Women in the military are outside the box to begin with, and women in general have a lot to take care of with the weight of feeling obligated to more responsibilities at home. As much as we like to think we have progressed, a women who asserts herself as focusing on something else than family or home can be seen as a bad spouse or mother. At the end of the day, if you are shocking and surprising people, you’re probably doing things right because you’re doing something that not a lot of people have done. It keeps me going, and thanks to my military training, I’ve learned that if you’re not edging on failure then you’re probably not pushing hard enough. I saw an article on Facebook on December 12, that I feel a need to respond to in order to set the record straight. 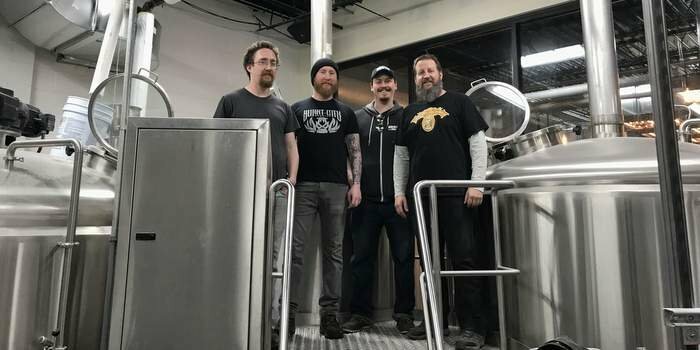 This article was republished from an article written in Chase News & Stories by Tori Fisher regarding Backward Flag Brewing Company, and its inception. In the article Tori Fisher claims that she had a dream to start a brewing business while she was in the military and claims that she had a passion to brew beer and “jumped off the cliff” and started brewing. Correction, her ex-husband Charles Fisher was the one with the dream. He a veteran still serving as a Black Hawk pilot in the Army National Guard was the one with the dream of brewing beer. Charles started brewing beer in their garage in Tuckerton, N.J., after a fellow veteran named Jeff Angle, who is in the Guard with him helped him learn the craft. Charles Fisher built all the equipment to brew beer, which he did as a hobby at the time in his and Tori’s first home. When Charles and Tori moved to Whiting they decided to look into starting a brewing business due to the encouragement of friends to brew more beer. So Charles, his friend Christopher De Angelo, also a pilot in the Army National Guard and a veteran, with Tori Fisher decided to look into starting a brewing business. Charles Fisher and Christopher De Angelo used their military pensions to fund the equipment and all other permits, building lease, etc. to start the brewery. Charles Fisher was the brew master, Tori along with Christopher DeAngelo managed the business. In addition, Christopher was a certified beer server and was a major financial contributor to get Backward Flag Brewery off the ground. Once the brewery was established, Tori Fisher wanted to control everything and became so overbearing that Charles her now ex-husband and Christopher DeAngelo no longer could work with her, and at that point Tori approached her partners to buy them out. Due to the hostile work environment and impossible demands on both Charles and Christopher they allowed the business to be bought out, but at a loss. Tori did not pay either Charles or Christopher the money that was owed to them, so her love of veterans apparently did not include the two men who MADE Backward Flag Brewing Company possible. Charles Fisher, is still active and a veteran of both the United States Navy where he deployed to Bosnia and the Army National Guard where he deployed to Iraq, and Christopher DeAngelo, is also still active and a veteran of the Army National Guard who was deployed to Afghanistan. It’s appalling that anyone would feel the need to not just take credit for something they did not do but to write articles about being a successful business woman and entrepreneur when there were two male partners, one of which was her ex-husband who was the one that really started it all. As I recall, she originally wanted a restaurant not a brewery, but saw an opportunity since her husband’s talent had been recognized. Tori Fisher is very talented at one thing, manipulation of the truth, not brewing beer. Her current brew master and affair partner Melinda Ramos, was taught how to brew beer by her ex-husband. One last point, she is not a harried single mom juggling a business career and taking care of her daughter, her ex husband Charles has their daughter four days a week, “super mom” has her three days while she is in school. Enough with the lies, as a woman I appreciate successful women, but this is fraud.